Home Agenda ACTION MAY: Join us in transnational actions ahead of the EP elections! ACTION MAY: Join us in transnational actions ahead of the EP elections! Save to Calendar 1-5-2019 12:00 am 9-5-2019 12:00 am ACTION MAY: Join us in transnational actions ahead of the EP elections! Join us in transnational actions ahead of the EP elections! 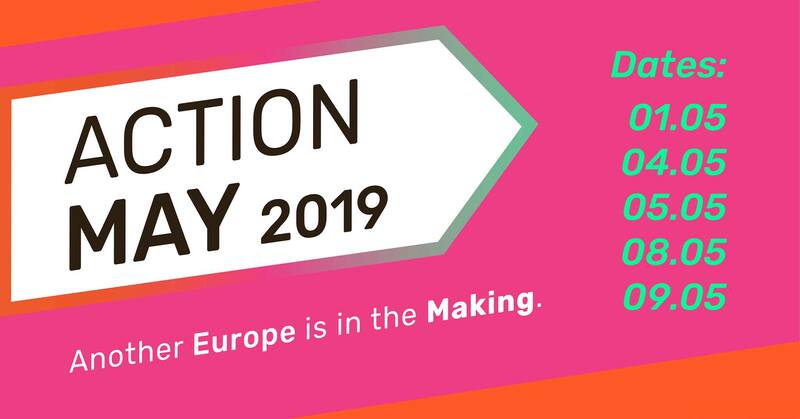 ACTION MAY is a transeuropean set of creative, disruptive, non-violent actions online and offline which will happen in cities across Europe this May 2019, from the 1st to the 9th. European May aims to make visible the diverse struggles in European society. We want to stand in solidarity with unions, defend free movement, denounce the continuous shrinking of civic space and the lack of equal representation at the top! We will also step against the red lines right-wing supporters and fascists cross everyday without anyone stepping up against: it’s time for civil society to get active! On 5 different days, European May, a dense network of activists, social movements, unions, communities and NGOs across the European continent, organizes actions which aim to foster an open and progressive vision for Europe. Join us and help organize the actions in your city! Check out which city is already organising on our map. Do you want to get involved? Contact us on our Facebook page or by mail: info@europeanmay.eu. We also regularly plan Welcome Calls, which are always open to join! Another Europe is in the making!